With a signal reception range of up to 90 metres and the use of Bluetooth 4.0 aptX, the Edifier E235 Luna E 2.1 THX-Certified Active Bluetooth Speaker System achieves high-quality sound, no matter where you place it. The Edifier E235 Luna E 2.1 THX-Certified Active Bluetooth Speaker System can be controlled from virtually anywhere in your house through your paired device. This powerful 2.1 speaker system is THX certified with built-in Digital Signal Processing, Dynamic Range Control and 3D Sound Processing. This model also features connectivity via optical or auxiliary input port, ideal for your Nintendo, Playstation or Xbox console. 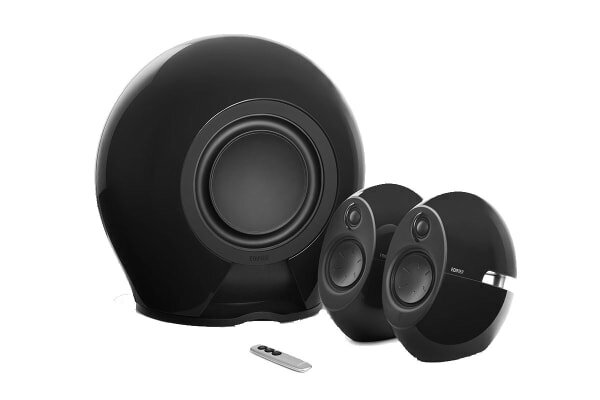 The subwoofer is wirelessly connected at a 5.8GHz radio frequency to its satellite companions and built with two 8” drivers to provide clear, crisp sound. With its 100 Watt built-in amplifier, the subwoofer takes your music to the next level, leaving the wires behind. Edifier’s E235 2.1 speaker system is controlled easily with the slick remote that accompanies the system. The small and thin remote fits right in your pocket for simple volume control. Thanks to the touch sensitive controls on the E235 Edifier system, the remote isn’t always necessary. The touch sensitive controls on the speaker allow you to turn the system on and off and adjust the volume without using the remote. It also features a swipe!